Recent trade disagreements and Interior Department activities have brought to bear a crucial difference between China and America's policy approaches to their respective clean energy industries; namely, that when America talks about providing capital, it is really only dealing with half the picture. While American policy makers have been obsessively focused on access to financing, China has approached the idea of capital with a broader definition, focusing both on access to funding as well as land. The importance of policy that makes prime land accessible to this emerging industry is only now becoming clear. 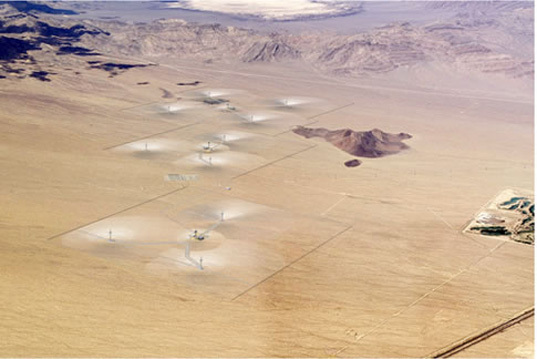 Tuesday's announcement, of the Interior Department's approval of the 1000 megawatt Blythe Solar Power Project on public land in California, alongside the groundbreaking of a $2 billion solar development on public land in Ivanpah, California, are steps in the right direction but still falls short of the comprehensive approach to capital that will be necessary to compete with China in the future. The recent complaint by the United Steel Workers Union to America's WTO representative about the Chinese government's unfair trade practices - including highly favorable land grant agreements with renewable companies - has brought China's aggressive industrial and trade policies into the spotlight. This coupled with the recent efforts of the Department of the Interior: Bureau of Land Management to make public land available for renewable power facilities, make clear that money isn't the only commodity the government must provide to foster the renewable energy sector. Renewable energy sources are in many cases not just more expensive then their traditional counterparts, but larger and more constrained during deployment by certain geographic necessities. Access to cheap and prime land then becomes a necessity for fostering renewable energy production and the markets for these products here in the U.S. In an era of concern about federal spending and deficits, a large majority of Americans (even among Republicans) support federal investment in energy research and development, finds a recent Pew survey. "There is broad public support for a variety of other proposals to address the nation's energy situation. About eight-in-ten (79%) favor requiring better fuel efficiency for cars, trucks and SUVs, and 74% support increasing federal funding for research on wind, solar and hydrogen technology." While the poll finds an overall decline in Republican support since 2008, a majority of Republicans still support these policies, with 64% of Republicans favoring increasing federal funding for alternative energy technology, down from 85% in 2008, and 79% supporting better fuel efficiency for automobiles, down 13 points from two years ago. Meanwhile, Democrat support has steadily increased in the past few years, with 84% in favor of increased federal investment in clean energy technologies and 89% endorsing higher fuel efficiency standards. Should We Borrow from the Future to Pay for Clean Energy Innovation Today? Against this background, it may sound mad to argue for more public borrowing in order to pay for investments in low carbon technologies and infrastructure, but that is what I am going to do in this post. Let's start with the rationale. ... The starting point is that in advanced economies successive generations tend to get better off over time. For example, at the depths of the 1930s depression Keynes observed that despite the general gloom, he was confident that 100 years in the future, people might be eight times better off in real terms. And indeed average GDP per capita in the UK is now already about 5 times what it was in the 1930s. By extension, we would normally expect future generations to be better off than us in GDP terms. ... [Furthermore, if] we in this generation mitigate climate change, we will allow future generations to have a higher standard of living than they would have if we did nothing. We are very slowly beginning to do this, with policies being introduced to encourage us to invest less in conventional capital (e.g. fossil fuel power stations) and more in investments that effectively maintain natural capital (like renewable energy). Political Climate's team makes the point that long-term government financing rather than bank loans is the right way to do this kind of borrowing, with fifty-year terms for government bonds that can be paid back over time by (now richer) future generations. Here in the United States, we financed much of the electrification, irrigation, and development of the American West (and the Tennessee Valley in the southeast) through precisely this kind of long-term government-backed borrowing. The hydroelectric dams and reservoirs, power lines and irrigation systems, clean and affordable energy, productive farms, and burgeoning new cities that resulted from these debt-financed investments paid off many times over, making generations living today far better off than if this debt hadn't been incurred. A similar case could be made for innovation investments as well, since the benefits of new, innovative products and technologies -- be it better clean energy technologies or pharmaceutical drugs -- will accrue most to those living in future times, who can harvest the rewards of today's investment in research and innovation. Thought provoking piece at least. What do you think, dear reader? Despite rising national debts, would national governments be wise to borrow today to fund investments in infrastructure, clean energy, and innovation to be enjoyed by -- and paid back by -- a richer, more well-off generation tomorrow? With the GOP set to make significant electoral gains on November 2nd, Republican Senator Lindsey Graham is urging the GOP to work together with Democrats and President Obama in the coming Congress to make bipartisan progress on the nation's energy challenges. But the South Carolina Republican pointedly rejected further work on a cap-and-trade proposal he briefly backed during the 110th Congress. "My belief is, if we get back in power in the House and get close in the Senate, that we ought to really clamp down on spending and reform the government. ... But we ought to not put ourselves in the position of being the party that said 'no' to hard problems, that we ought to ... come up with an energy policy without cap and trade that will create energy jobs in America, break our dependency on foreign oil and clean up the air. ... There's plenty of things that we could do that would be good for job creation by challenging the president to come to the middle and find ways to move forward as a nation, and put the burden on him to say 'no' to us." 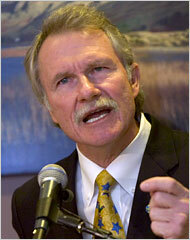 "Energy legislation in the Senate has stalled, and our energy policy in America is nonexistent. The EPA's going to start regulating carbon in January if the Congress doesn't act. So one of the real priorities of the Congress and the nation ought to be energy independence." "Does November GOP Win Spell the End for Clean Energy Progress? Maybe Not"
A slew of critical news articles about a clean energy stimulus program have suggested both that the program is a government boondoggle and that the Obama Administration has inflated the number of jobs supported by the program. Both contentions are misleading. "The Obama administration is crediting its anti-recession stimulus plan with creating up to 50,000 jobs on dozens of wind farms, even though many of those wind farms were built before the stimulus money began to flow or even before President Barack Obama was inaugurated." It is true that some of the projects that received funding under the stimulus-funded Section 1603 cash grant program went to projects that had completed construction prior to the stimulus bill. The MSNBC article, written by journalist Russ Choma, notes that 11 of the 70 major wind farms that received grants had erected their wind towers during the Bush Administration. The problem is that this fact fundamentally misses the point. As we noted yesterday in a post on this blog, the stimulus-funded grant program did not waste taxpayer money. Projects that received cash grants under the Treasury's section 1603 stimulus program (the subject of recent criticisms) received the grants instead of tax credits that would have cost the government an equivalent amount. Here's the deal: Since most clean energy project developers are too small to have a large tax appetite, they partner with larger financial institutions to fund the project, which then claim the benefit on the project's behalf. However, when the bottom fell out of tax equity markets amidst the financial crisis of 2008 and the resulting recession, many tax equity investors withdrew from projects on the drawing boards and walked away from some projects already underway. In such cases, the cash grant program was essential to keeping the project financially viable, under construction, and putting Americans to work. Furthermore, the cash grant program did support more than 50,000 short-term jobs during the height of the recession and nearly 4,000 long-term, permanent jobs, according to conservative estimates. The MSNBC article suggests that the Obama Administration is counting jobs resulting from Bush-era projects in its estimates of job creation resulting from the Section 1603 program. According to the article, Administration officials have claimed that the stimulus program has supported 50,000 jobs. But that estimate, often invoked by the American Wind Energy Association (AWEA), is corroborated by a recent study by the Lawrence Berkeley National Laboratory (LBNL) on the job creation impacts of the grant program that explicitly excludes jobs associated with the Bush-era projects. Indeed, of the nearly 6.2 GW of newly installed wind energy projects that elected the cash grant incentive, the LBNL analysts discount nearly 60% of them as projects for which the grant may not have been essential for completion (e.g. projects were already completed or would have otherwise been able to utilize the production tax credit, or PTC, to help finance the projects). According to LBNL's model, construction and operation of the remaining 2.4 GW of new wind projects - which would not have been completed without the cash grant program - "supported 51,600 gross short-term job-years during the construction phase, and 3,860 gross long-term jobs during the operational phase." Administration claims that the program supported "50,000 jobs" are thus supported by this independent analysis. Further, some additional jobs were also likely supported at construction projects that had already begun but would have otherwise halted amidst the tumult of the financial crisis and the recession. These jobs, which may have been saved by the cash grant program, are not included in the LBNL estimate, which is thus likely on the conservative side. One of the other main criticisms leveled by the MSNBC article appears to be that most of the jobs supported are short term. Well, what else would be expected from a short-term stimulus measure supporting construction projects? The goal of stimulus programs, after all, are to get Americans to work during an era of economic crisis and soaring unemployment, and in that vein, the cash grant program helped support at least 50,000 American jobs, all while stimulating significant private-sector investment activity - for every dollar of federal grants, $2.33 in private investments flowed to clean energy projects. 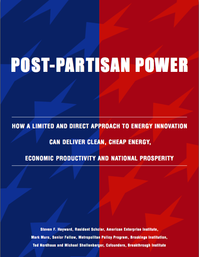 As we argued previously, while the stimulus was hastily constructed and not particularly well optimized, the program ultimately helped forestall the collapse of the domestic clean energy industry. Total deployed wind capacity would have certainly been lower, and bankruptcies, shuttered projects, and laid-off employees far higher without the program. This would have been a major setback and killed any momentum toward efforts to create a robust clean energy economy in the United States. The cash grant program could certainly be improved in a number of ways, which we detailed in our previous post. But notwithstanding the controversy that the media - and multiple Congressional campaign offices - have manufactured around the program, it is yet one more example of how public investment in clean energy technologies can support job creation and leverage private funding for a cleaner, more secure energy future. A stimulus program to boost the deployment of clean energy technology has come under criticism for contributing funds to projects that had started construction before the stimulus bill was passed. A long and in depth Greenwire story notes that 64 percent of the 50 highest dollar grants went to such projects. While the hastily-constructed stimulus programs for clean energy could have been better optimized, those arguing that the Section 1603 clean energy grant program somehow created a boondoggle are completely off base. Any projects already under construction would have received an equivalent benefit in a better economy, and the stimulus-funded clean energy grant program has been a successful job creator in an industry that was once near collapse. For decades, the main policy instruments to drive the deployment of clean energy have been the production tax credit (PTC) for wind and the investment tax credit (ITC) for most other technologies. The ITC for example subsidized 30% of the capital costs of new clean energy projects, while the PTC provided a comparable production incentive for renewable energy generation (projects only claim one or the other credit, not both). To obtain the credits, renewable energy providers generally partnered with investment banks or insurance companies who have the tax appetite to finance capital-intensive renewable energy projects and claim the credit. "Right now with the stock market not being its healthiest, the sort of plain vanilla non-emerging technologies -- those are the projects that are going to get financed." As a result, clean energy projects came to a halt. Clean energy jobs were in peril, and barring other forms of financial support, would likely be lost, perhaps permanently. Stimulus-funded Clean Energy Grants: Industry Savior or Government Boondoggle? Enter the stimulus-funded Section 1603 clean energy cash grant program. Instead of claiming the normal tax credits, companies could receive a grant when projects are placed in service, obviating the need to find a tax equity investor. Companies would receive the same benefit, but they would have more assurance it the incentives would be there when the project was completed. Even for those projects that were already under construction before the stimulus, they simply received a grant in lieu of a tax credit that they would have otherwise received from the federal government, at essentially the same cost. The argument that providing grants to clean energy projects already under construction when the stimulus program began is some kind of boondoggle misses the point at both the level of an individual project, and the clean energy sector as a whole. When it comes to individual projects, two cases are possible. In the first case, despite the recession's impact on financial markets, the project developer could have found tax equity partners to claim the normal tax credits. In this case, the cash grant was unnecessary, but the cost to the government would have been the same, since the developer would have cashed in the equivalent tax credits anyway. So no boondoggle there. If, on the other hand, the recession forced a tax equity partner to withdraw from a project already under construction, the project developer would be saddled with a major financial problem, with construction costs already committed to the project but a key financial backer now absent. In this case, the cash grant would have been absolutely essential to keeping the project financially viable and construction (and the associated jobs) underway. In other words, the grant program would have worked exactly as planned, even though the project began construction before the stimulus was enacted. At the scale of the clean energy sector as a whole the effects of the cash grant program have been substantial and positive. A study by the Lawrence Berkeley National Lab estimates that the grant supported more than 50,000 short-term job-years and 4,000 long-term job-years. And as Breakthrough's Jesse Jenkins and Yael Borofsky reported a year ago, the investment from the cash grant program has leveraged much greater private investment in the sector, leveraging $2.33 in private investment for every dollar of federal funds. The program also contributed to a major expansion of new wind power capacity in 2009, despite the economic crisis underway. 10,000 MW of new wind power capacity, more than double the capacity forecast at the start that year, came online in 2009. Iberdrola Renewables, a Spanish wind energy company with a presence in the United States, told Greenwire that were it not for the cash grant program, it would have invested outside of the United States. Even more solar and other renewable energy facilities came online with help from the cash grant program, creating jobs and spurring financial investment at a critical juncture in the recession. In short, the cash grant program was successful at what it was intended to do--revitalize the clean energy industry at a time of near-collapse. Now, with the program's expiration imminent, and credit markets still largely frozen, clean energy developers are rightly worried that clean energy investment will soon dry up once again. With other nations redoubling their efforts to create competitive clean tech industries, moving away from a clean energy economy would be shortsighted, to say the least. While the cash grant program helped forestall the collapse of the U.S. clean tech industry, the United States needs a smarter deployment strategy if it hopes to build a competitive domestic clean energy economy and take advantage of new export opportunities around the world. The current clean energy deployment model in the United States is not optimized to drive innovation. The PTC, ITC, and the cash grant all subsidize the deployment of existing and higher-cost clean energy technologies without encouraging the continual innovation that can reduce the unsubsidized costs of those technologies over time. While the short-term calculus of economic stimulus may prioritize getting steel in the ground today, any long-term strategy to build competitive American clean energy industries will need to see U.S. firms become the most innovative, cost-competitive companies in the world. The end goal must be building robust, competitive industries that do not require permanent subsidies to thrive in global or domestic markets. Getting there will require deployment policies that reward companies who continuously improve designs and cut costs over time, rather than those that just build more of the same product. Furthermore, if the United States hopes to build a robust and competitive clean tech industry, deployment is only one piece of the pie. More substantial efforts are needed to spur the creation of domestic clean energy manufacturing capacity, and to invest directly in energy innovation through a major scale-up in federal funding for clean energy research and development. With little time left to achieve any victories on clean energy, Congress should make extending and optimizing clean energy deployment incentive programs like the Section 1603 program a priority. Here's your daily dose of sanity, courtesy of EPA regional administrator Shawn Garvin, who has recommended that the agency veto a Clean Water Act permit for the massive Spruce No. 1 mountaintop removal coal mine in Logan County, W.Va.
Mr. Garvin's commonsensical rationale? Apparently burying several miles of pristine Appalachian headwaters and replacing them with landfill and a toxic sludge dump will adversely impact downstream waters and wildlife. … Region III has determined that discharges of dredged and/or fill material to Pigeonroost Branch and Oldhouse Branch for the purpose of constructing the Spruce No. 1 Surface Mine as currently authorized … would likely have unacceptable adverse effects on wildlife … [the permit] authorizes construction of valley fills and sedimentation ponds and other discharges into Pigeonroost Branch and Oldhouse Branch that will bury approximately 6.6 miles of high quality headwater streams. … Because construction of the Spruce No. 1 Mine and 11 additional mining operations would increase the percent of the sub-basin that is impacted by mining activity, it can be expected that these water quality effects will likely be exacerbated by these additional mines. EPA believes that the Spruce No. 1 Mine project, in conjunction with the other mining operations either under construction or proposed for the Coal River sub-basin, will be likely to contribute to the significant cumulative loss of aquatic resources and degradation of water quality. This isn't the end of the line for the controversial mountaintop removal project. EPA took pains to be clear that the agency "has not reached a final decision on this project," and promised to next "reach out to the mining company, the U.S. Army Corps of Engineers, and West Virginia State officials to engage in discussions about potential actions that can be taken to reduce impacts on the environment and to the waters that Appalachian communities depend on for drinking, swimming and fishing." Update: more sanity from 50 members of Congress who wrote the EPA to support a stronger stance on protecting clean waters from the impacts of mountaintop removal mining operations, and to recommend the EPA's veto of the Spruce No. 1 mine. More here. "In the last half-century, many of the United States' great technological breakthroughs have been made possible because of the demand created by large-scale government projects—which, in this country, has mainly meant military and space projects... In this same way, the military's demand for renewable-energy technologies today could create the conditions for a wide commercial market in the years ahead." Also important is his recognition of the policy advantages of housing such large scale projects within the Department of Defense. Whereas Department of Energy programs face financial uncertainty, see ARPA-E, DoD programs enjoy long term funding because of the uniquely insulated nature of defense spending. "Congress is more likely to fund these projects precisely because they're related to the national defense. The United States has an elaborate nationwide highway system today because, back in 1956, President Dwight Eisenhower sold the program to Congress by calling it the National Interstate and Defense Highway Act (italics added)." "Congress today has little appetite for spending billions of dollars on solar power generators or biofuel labs under the rubric of energy independence or 'going green.' But to serve the war mission, and especially to protect the troops, no sum is too lavish—and that's why the road to going green, and to achieving energy independence, might very well be paved through the fighting fields and villages of Afghanistan." It seems that we are finding a new use for solar power everyday. Whether its grid-tie applications, lighting, or backup power, solar is rapidly becoming our green energy alternative of choice. Solar is rapidly evolving as the technology and applications for it are changing daily. In this light, here are 3 great contests that are stretching the limits of what solar can be used for and may just change the way we use energy in our everyday lives. It’s a cross-country race held annually with futuristic cars powered exclusively by the sun. Dozens of university teams from the United States, Canada, and Europe design and build their own solar cars. Teams have to build cars using the absolute lightest materials available. They also have to engineer the power systems that will collect energy from the sun, store it, and transfer it to the drive mechanism. All of this must be done in the most efficient way possible so that the car can travel the course safely and in the shortest amount of time. The University of Michigan won this year’s event that stretched from Kansas to Chicago. Transportation consumes about 40% of our energy resources now. Electric cars have taken huge leaps in the last few years and can reduce our dependency on carbon fuels if they can be charged using renewable energy. But the technology needs to make huge advances to really make an impact. Changing the way we use materials in vehicles, storing power efficiently, and harnessing solar power will be essential if electric cars are going to help solve our energy and climate crisis. A contest sponsored by the US Department of Energy to create the most energy efficient homes in the world. Teams from American, Canadian, and European universities design, build, and then transport a home to the Washington Mall to be judged by industry and government experts. The homes are judged on 10 separate factors: Architecture, Market Viability, Engineering, Lighting Design, Communications, Comfort Zone, Hot Water, Appliances, Home Entertainment, and Net Metering. The challenge to balance energy needs, comfort, and aesthetics while making a home that could actually sell in the market. The team from Germany won the event in 2009 and won major points by incorporating solar panels into the exterior shell of the home. In order for us to change the way we use energy, we have to change the way we live. The best way to do this of course, is to change the way we build our homes. We can have beautiful, comfortable homes that actually produce as much energy as they use. Contests like this challenge the brightest minds to redefine the spaces we live in. A contest to develop effective and affordable off-grid solar solutions. The contest is geared more toward finding power solutions for the developing world where electricity is often unreliable or nonexistent. The prize is an investment from Deutsche Bank Americas Foundation of $250,000. Contestants from 58 organizations and 29 countries enter solar inventions that address lighting, home systems, mini-grid, and hybrid solar-wind systems that can help low-income communities. The winner this year, Greenlight Planet, developed a way for everyday Indian citizens to afford and install their own home solar system. Worldwide about 1.7 billion people live without electricity. Bringing electricity to these people can mean improved health, communications, education, and quality of life for millions. It also means that fewer communities will be exposed to the environmental and health risks that are posed by traditional means of power, which include kerosene lanterns and diesel generators. Kriss Bergethon is a writer and solar expert from Colorado. Fore more information visit his site at Solar Power. When does inaction on energy reform go too far? When it risks our nation’s economic health? When it leads our planet towards environmental catastrophe? Surely we must draw a line when it puts American soldiers directly in harms way. 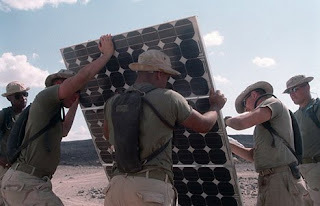 A recent New York Times article suggests that the military has seen enough, and in the absence of Congressional action, is taking the lead on developing clean energy technologies. This new role for the military should come as no surprise. The Department of Defense is the largest single consumer of energy in the United States. In 2007, it consumed 1,100 trillion BTU's—more than the entire country of Nigeria and at a higher per-capita rate than all but three countries in the world. The DoD further estimates that for every $10 increase in the per barrel price of oil, it costs the militairy $1.3 billion. 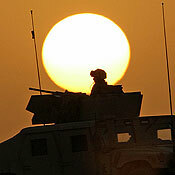 At the same time, energy is the key enabler of US military combat power. American military force is tethered to increasingly vulnerable fuel supplies: “In Iraq and Afghanistan, one Army study found, for every 24 fuel convoys that set out, one soldier or civilian engaged in fuel transport was killed."